Packed with comic capers and animal antics, this brilliantly bold book follows Mouse's madcap race after Gorilla through a variety of exciting settings. Kids adore books that are games as well. 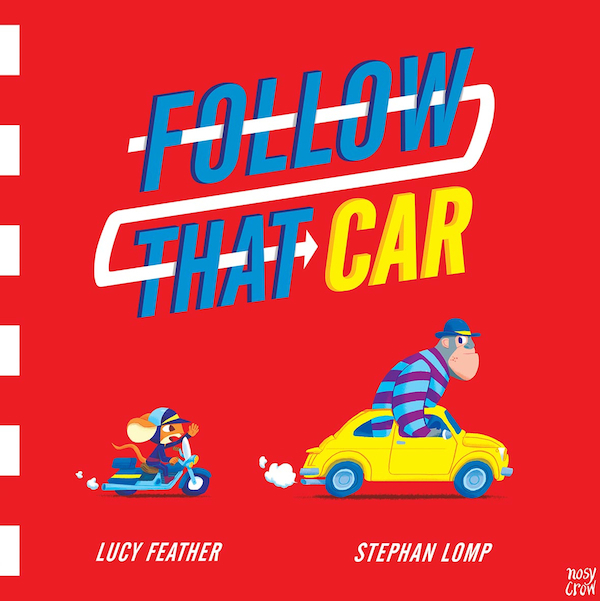 Follow that Car invites children to help Mouse, on a motor scooter, catch up with Gorilla, in a very fast car. Illustrations are detailed, but individual elements are quite large because of the book’s size, making it perfect for sharing with a group. It also works well as a Where’s Wally-type of puzzle book. Kids can track the route to get from Mouse to Gorilla, but then go back to enjoy and discuss all the individual scenes in each double page spread. Lomp has done an excellent job with the illustrations. They’re colourful, exuberant, full of energy and humour. Children who love books about things that go will be in heaven with Follow that Car, but I predict kids who enjoy exciting visuals and puzzles will also pore over it for ages. It could double as a counting book, a useful resource for positional vocabulary, a resource for mapping, and a great way to get kids talking about what they see. I really like that it’s a large-sized, sturdy and quality hard cover book, perfect for classrooms, libraries and homes. Take a look inside the book via Nosy Crow’s website.